So you just purchased a home! Congratulations! Now all you need to do is move in, unbox your stuff and you’re good to go, right? Wrong! After buying a home there are a number of things you should do to make it habitable for yourself. Doing these steps will make your home buying and move in experience go much smoother. You’ll also be aware of any defects (that you can claim on your home warranty if you purchased one,) before they become big expensive problems. – Rekey or replace all locks. You don’t know who might have keys to your new house. Lock and door knob sets are about $100-$200 per door for decent quality ones. – Mow (or hire a one time lawn service.) 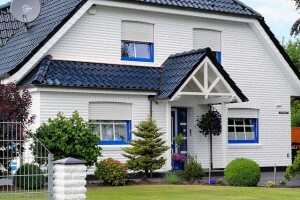 Frequently a house sits vacant for several weeks before your move in. Having a landscaper come out can cost as little as $50, but can make a world of difference. – Clean and Check gutters. Usually a home inspection will catch any problems but you want to check downspouts for leaks and where they drain. 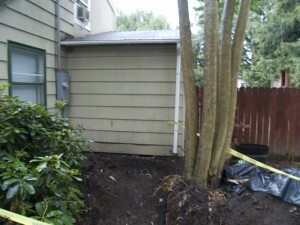 Leaky gutters are one of the biggest causes of basement and crawlspace leaks. A simple fix here can save you headache and money later. A lot of leaks are caused by gutters not being cleaned out properly! – Find the water main shut off. In a lot of newer homes this is easily accessible through the crawl space. Older homes may not have them at all. If you don’t have one, a couple of hundred dollars for a plumber to install one could be a lifesaver down the road. – Find the gas shut off. This typically requires a wrench. 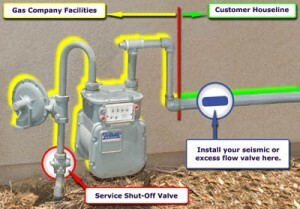 The valve is usually easy to find as the follow image shows. I personally like to have a standard crescent wrench stashed in a kitchen drawer with a painted red handle for this reason, but there are specialized tools that work too. In an emergency, just rotate the service shut off valve. – Paint the interior! Do this before you move in and have stuff in the way. If you do this yourself it’ll just be the cost of supplies which is about $300 for supplies and paint in an average sized 1500 square foot house. If you have someone paint it for you, prices can vary widely depending on the skill of the contractor. Use this calculator to get a ball park figure when approaching professional painters. – Replace light switches and faceplates. Light switches are only a couple of bucks each, even less if you buy a ten pack. Faceplates are frequently less then a dollar. Make sure to check for lights that are turned off by one or more switches. You’ll need to get a three way switch which are more expensive for each of these. Lastly, fire code in most areas mandate putting CFI outlets near sources of water like sinks. If they get wet they’ll trip and shut off power instead of potentially starting a fire. – Test and label each switch in the electrical panel. You’ll need to switch power off to replace the light switches anyways so this is a good time to test the breakers. Use a small table lamp to test each outlet and figure out what rooms each breaker controls. Clearly label them with a label maker because I can tell you out of experience nothing is worse then trying to read a faded label written in bad hand writing while your power is out and you only have a weak flashlight for illumination. – Install smoke detectors in each bedroom. Get the combination smoke/CO2 detectors if you have gas and install another one near any appliances that use gas. They can get expensive, but are good for many years as long as you test the battery on a regular basis. They can also save your life, so I would scrimp on only having one total. – Clean and maintain the HVAC system. This can be done yourself, but I personally recommend having a professional do this for you. This usually only costs a couple of hundred dollars, but they can look at a system and see problems that you may not notice. A simple replacement of bad parts now can save replacing a several thousand dollar system later. While doing this, go ahead and replace the filter too. If you suffer from allergies it is a good idea to get a HEPA filter. – Have the ducts cleaned. This seems to be one of the most often overlooked things but can make a huge difference. Dirty ducts will affect the efficiency of your HVAC system and can prolong allergies. Try to get someone who has the proper tools to do this. The $99 duct cleaning service coupons in your mail are not the way to go. A good cleaner should be $300-$500 in most areas. They will also be able to tell you if you have any loose ducts and if you have closed dampers that might also being affecting HVAC efficiency. – Replace the HVAC thermostat with a programable one. Set it to be cooler during the days when no one is home and at night when everyone is asleep. This will save you a lot of money in the long run and usually pay for itself in only a couple of years. If you can afford it, get the Nest Thermostat. – Clean everything else! This is another minor thing that can make a huge difference. Steam clean carpets. Clean windows, window sills, doors, etc. Scrub bathtubs and showers. So now that you have done all of that it is finally time to actually move in! – Before packing, donate or sell anything that you don’t need or want. – Label and pack boxes for which room they are going to. Do not label for what is in the box. – If you have boxes that just go into storage, have shelves ready to receive them. High quality industrial shelving for garages and basements can be had fairly cheaply. – Break down boxes as you empty them and put in a corner. This will make the unpacking process go faster and smoother when you aren’t stumbling over empty boxes. So this is my standard list. What do you do when you first move into a new place? The City of Beaverton recently started putting in new sewer mains and pipes all the way up to each house in my neighborhood. The contractor for this was Dunn Construction, who have been extremely professional in my opinion during this whole time. They have taken extreme care not to block my driveway unless absolutely necessary, and the foreman has been forward with all my questions. 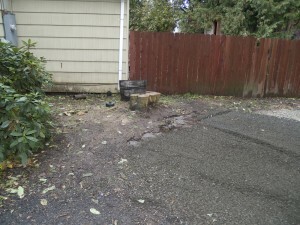 In case it’s not obvious (and there was more done later,) the 2×2 foot hole turned into a huge trench two to three feet deep, along the length of that house wall, and surrounding three sides of the tree with the roots totally removed. So this tree had literally one root instead of four supporting it. Not too big of a deal, we cut it down the next weekend and ALMOST fell the last piece on to the house. Luckily we were able to pull it the opposite way in the nick of time. Fast forward a few weeks. Renter upstairs gets evicted for not paying rent. Salvation Army comes along to pick up her washer and dryer on moving day. The washer was never turned on at all. They “turned off” the water, and caused the pipe to break. Apparently it was weak. 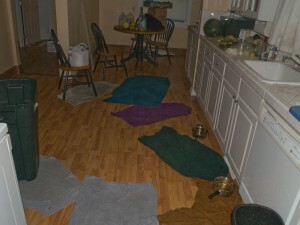 Several hundred gallons of water later pouring into the kitchen and hallway we manage to get it turned off. 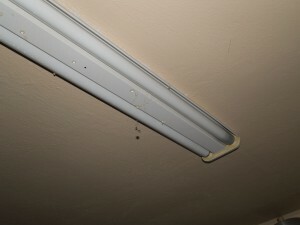 This is residual water leaking FROM all the lights. And yes, there is asbestos in that! The kitchen has been dried out, but all the counters are gone, all the flooring is gone and the walls are ripped away to bare studs. I come home in the morning a couple of days ago to this sight. My first thought was “Oh, flat tire. OK, not a problem I can fix that.” A better LOOK at the flat tire reveals that it’s IN THE FREAKING GROUND up to the hub. That was a bigger problem, especially after I shined a light down to see what was up with it. 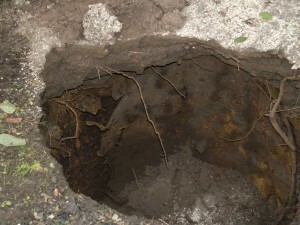 Second thought was “Oh crap, sinkhole due to a water break from the pipes!” as the hole was about six feet deep from what I could see. Tow Truck was called. 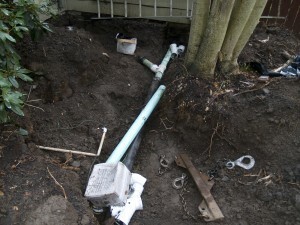 City of Beaverton was called, specifically the guy in charge of this water pipe project. He in turn called Dunn Construction and we all sat around and waited for the tow truck guys to get the motor home out of the hole, which they did in about twenty minutes. The old Septic tank. Six feet deep and four feet across. It seems when this house was built it was outside of the city limits. In fact the city limits were at the center of the road in FRONT of the house. So the septic tank was put on the property near by. 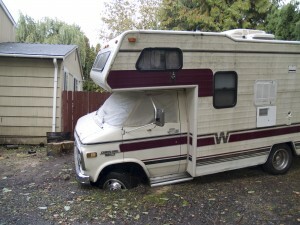 I was led to believe that the septic tank was some where in the backyard. But it seems that it was never actually filled in. About a foot and a half of dirt covered the top, which was rusted through. What’s really funny about this is that Dunn Construction had been running all kinds of nice heavy equipment right across the top of this area for several days with no problem at all, but I guess the weight of the motor home on it for almost a month is what did it in. But an hour later, a couple loads of gravel, the loan of one of Dunn’s BIG tractors to pact it down. The best part about having a house? Having a garden! These little beauties are coming along nicely. 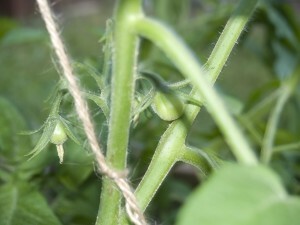 Of the three types of tomatoes I’ve got, two types are coming in. Either the third is a later bloomer (I hope,) or it’s being blocked from the sun too much by the bigger plants. These are huge heirloom tomatoes on the same size as the more common beefsteak tomatoes. They’re supposed to have much more flavor too. 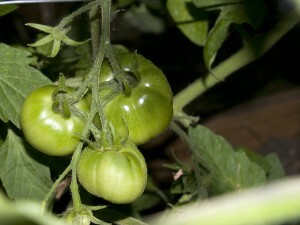 Apparently this strain was rediscovered in 1985 and has quickly become the most popular heirloom tomato. The Japanese Black Trifele originated in Russia instead of Japan. It’s apparently going to be the size and shape of a Bartlett Pear, but will be a more purple color. Buying a house these days is not like the heady good old days of free ARM’s being given out to every one who asked without any type of references what so ever. The difficulties of house buying in this day and age are near infinite it seems. We finally closed after the Mortgage Officer had literally gone through six different companies. One wanted us to have slightly better credit. One wanted us to not buy in this neighborhood at all. One wanted a bigger down payment. One wanted us to carry more mortgage insurance with a bigger up front payment. Ironically, paying a few thousand MORE for the house got us to go with this last one AND a smaller down payment. This of course was all on top of the seller’s two lenders who had to approve the whole thing. It was literally down to the wire before foreclosure and only proof that we were interested in the house and had an offer in allowed the lenders to keep from doing so. Ironically, this has caused us to get two “letters” from companies seeking to refinance us on our “foreclosure” due to the time it takes all the public records to get updated. So here is the old owner’s garden. In the middle of December when we first were browsing the market. Here is the same view, last week. I’m letting the second bed go because I’m planning on starting a whole new one in another part of the yard so weeds are pretty bad. The front bed will go away in the fall after we’ve harvested everything. There are two brandywine tomato plants, a Japanese heirloom tomato who’s name escapes me, white sweet corn, Anaheim hot peppers, another heirloom tomato, and “pizza” peppers. This menagerie of plants were products of an impulse buy at Costco, who had six organic plants (Tomatoes and peppers,) for $15 or so. 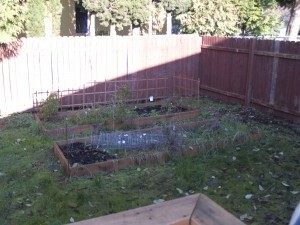 Also in the picture are two Camas plants which are doing pretty well considering they’re still in the pots, a Chinese Tea Plant, and hidden way in the corner are four lonely strawberry plants that the squirrels ate before the berries even had a chance to get ripe. Off picture is two potato stacks made of old truck tires and filled with red potatoes. Thanks to “Steve”, the previous owner for leaving them in the garage for me to “dispose” of, along with 40 plus gallons of used motor oil. The theory is to plant the potatoes in the first tire then when it’s 6-8 inches above the top, put another tire on and more dirt. Repeat until you’re four or five tires up. Then harvest in the fall and enjoy the bounty of fresh potatoes. 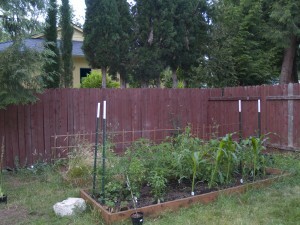 The eventual plan is to dedicate a large portion of the yard to vegetables and fruits. The good thing about the weeds and grass is that right now they’re providing plenty of foliage for the compost piles, which will of course make it’s way back into the raised beds next year. I might also have to add a green house for early starters to increase the growing season. On top of this all, I’m relearning everything I might have ever known about gardening. Luckily it’s mostly common sense.